In 2017, Griffith Sciences funded a variety of blended learning and teaching initiatives to support the university’s agenda for innovation in learning and teaching and, in particular, blended learning. 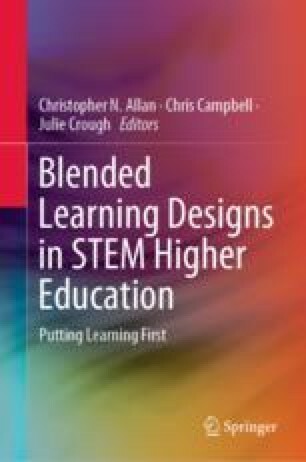 Noting the literature, it was realised that in order for blended learning to enhance student learning, Griffith Science academics would need a safe space to become aware of the possibilities, the affordances and the challenges of using technology within their classrooms. To support these initiatives, the Griffith Sciences Learning and Teaching team developed a community of usable scholarly practice (the CUSP) that provided the academics technical and pedagogical support (including developing learning designs that could be used by them and others), help with the collection of evaluation data, an environment to showcase their learning and teaching as well as opportunities for feedback and benchmarking with other STEM practitioners. The CUSP became a successful element of the Griffith Sciences informal learning environment. This chapter showcases the types of community meetings and the benefits of community in implementing innovation. Dancy, M., Henderson, C., & Turpen, C. (2016). How faculty learn about and implement research-based instructional strategies: The case of peer instruction. Physical Review Physics Education Research, 12(1). https://doi.org/10.1103/physrevphyseducres.12.010110.